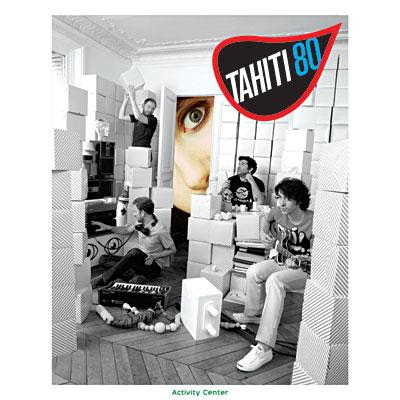 I've known about Tahiti 80 for years. Used to play them back when the Miami Indie Scene was still in it's infancy circa '2000' era PopLife. Their first album Puzzle featured the amazing Heartbeat which would get tons of play from us back in the day. Even to this day whenever I hear that track it brings back feelings of nostalgia. Except nowadays it's mostly an at-home endeavor. Not too many people play out Indie Pop anymore. The new tracks I've heard so far, (about 6) are all stellar! They seem to have tonned down their trademark synth sound for a more conventional live band sound, but it's still fantastic and totally them. A good pop hook is a good pop hook and they have tons of those. Plus amazing guitar strumming and the lead singer's voice is still one of the most beautiful singing voices out there. Check out these great new tracks 'Tune In' (my fav!) and 'Ear to the Ground', plus their Video for First Single 'All Around'. As a bonus here's Heartbeat as well.